The history of humans and carnivores in North America since European colonization is lopsided and biocidal. Whereas attacks by native carnivores on humans are so rare as to be statistically insignificant, European settlers and their descendants have shot, trapped, and poisoned predators by the millions, declaring war especially on Pumas and Wolves. Within an historical blink of an eye, these carnivores were all but eliminated from the eastern two-thirds of the continent south of the boreal forest. Now, in 2018, as we enter a century of climate chaos, only tiny eastern populations persist of the keystone predators who protect forests from over-browsing. A small remnant population of Pumas (Panthers) exists in south Florida, and a tiny reintroduced population of Red Wolves struggles for survival in coastal North Carolina. An unknown number of Coyote/Wolf hybrids wander the Northeast, but these opportunistic “Coy-Wolves” can easily enough scavenge deer and other animals shot or killed by cars that they are not reliable year-round hunters of the East’s most over-abundant browser. The southern-most reproducing Wolf population in eastern Canada is faring relatively well in Algonquin Park, but these Wolves rarely escape guns, traps, and cars for long, if they leave the Park. As eastern ecosystems continue to suffer from their loss of top predators, we are overdue to bring them back, to welcome home Pumas and Wolves. To that end, The Rewilding Institute, Cougar Rewilding Foundation, Wildlands Network, Project Coyote, and allied groups call upon our fellow conservationists and recreationists to work toward restoring healthy populations of all native species, but particularly top carnivores and other keystone members of our biota, across their native ranges. All species eliminated from their original ranges in North America deserve to be restored, if it’s not too late (as it is for the Passenger Pigeon, Carolina Parakeet, Great Auk, Imperial Woodpecker, Sea Mink, and others persecuted unto extinction). 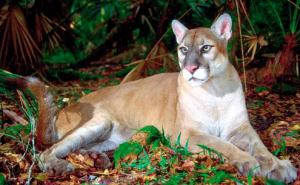 Of highest priority, however, is restoring the Puma, also known as Cougar, Panther, Painter, Catamount, and Mountain Lion (Puma concolor). Wolves are equally important, but their recovery in the East may be more complicated, for social and genetic reasons. Large canids seem to be regaining a claw-hold on their own, through Wolves occasionally interbreeding with Coyotes, who are so resourceful they are now thriving in most of the country (though perhaps taking on Wolf characteristics so far mainly in the northeastern US and southeastern Canada; and again, not often playing the critical role of regulating deer herds). We’ll also not address in this paper the many other carnivores still playing – or having recently returned to play — vital roles in eastern ecosystems, except to note that conservationists should not be complacent about the long-term well-being of Black Bear, River Otter, Marten, Fisher, Bobcat, or foxes. Combinations of habitat fragmentation, climate chaos, and direct killing could leave any or all of these other carnivores in trouble eventually. We do want to quickly emphasize that although they may not generally be considered keystone species or apex predators, Canada Lynx and Wolverine are both vital members of boreal ecosystems in North America, and richly deserve our conservation concern. Indeed, some conservationists have suggested that the Lynx could be something of a “gateway cat” for preparing people in the US Northeast for Puma recovery. Most of these carnivores are capable of wide dispersals, and most of them will need safe wildlife corridors between core habitats if they are to thrive in the coming, climatically-unstable, centuries. 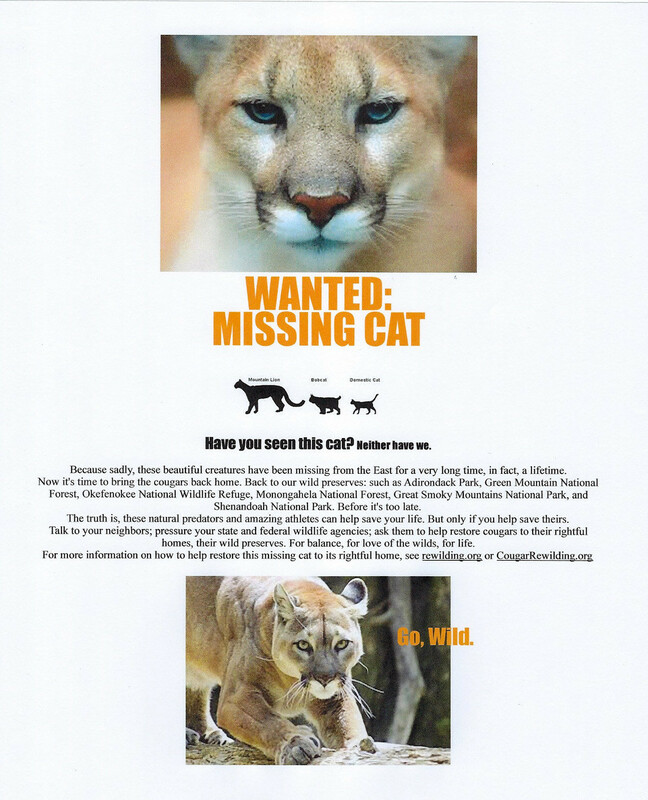 for the printable Missing Cat bulletin featured below. 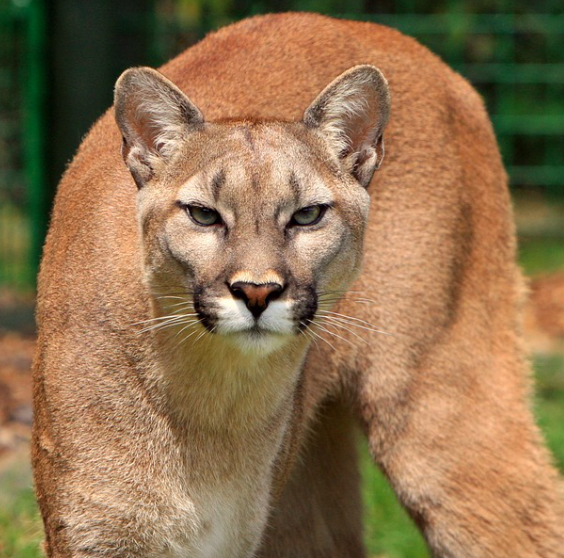 Predators need to be able to roam over long long distances. For there to be any hope for top predators, we need to ensure continuous wildlife corridors. The concept of “parks” has been nearly useless for the preservation of ecosystems. I truly believe in rewilding, but it will only happen if there is a depopulation of Homo sapiens, we are fundamentally incompatible with nature.